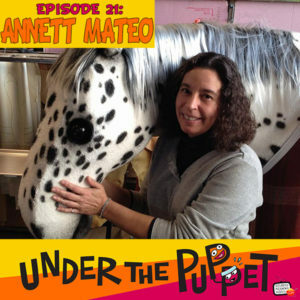 http://www.UnderThePuppet.com – Recorded live at Felt-A-Con in Seattle, Washington, this is a wonderful interview with puppeteer and builder Annett Mateo who is the Master Puppet Artisan for Seattle’s Children’s Theatre. She also owns her own puppet building company Puppetlandla. In this interview we talk about her career and many of the projects she has worked on.